One of the primal mechanical properties of activated carbon is the mechanical strength. It can be defined as the resistance to abrasion or attrition during its use. A variety of tests are available for the evaluation of the mechanical strength of granular activated carbon. In these tests the change in particle size distribution or the amount of fines produced is determined. Different mechanical strength test methods measures different aspects of strengths and can thus mathematically not be related to one another. The most common test method is Hardness number followed by abrasion number. The Hardness number (DSTM 20) measures the external integrity against wearing along exterior and breakage of small points of activated carbon. It is expressed as a percentage of loss on a particular sieve after shaking granules under certain conditions. The abrasion number (AWWA B604) measures the structural strength of granular activated carbon. It is a measure of the ability of the particle to stand up to shear forces caused by particles rubbing together or particles rubbing against another surface such as a column wall or supporting screen. 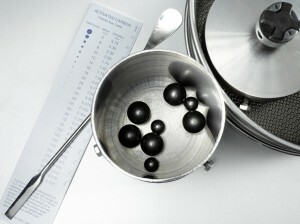 It is measured by shaking granules with steel balls in a container under certain conditions and expressed as a percentage reduction in Mean Particle Diameter (mpd).